The Feria Side Wall is an elegant, high quality solution that can be used to easily enclose the sides of your patio cover. Each unit covers one side of the Feria patio cover and is compatible with all cover sizes. The clear plastic panels provide year round protection from wind, rain and snow, and the low maintenance, high end powder-coated aluminum frame will not rust, rot or peel. 10 Year Limited Warranty. For information on this product, please call our Customer Service Centre at 1-800-866-5749. Adding privacy and shade from the sun's harsh rays, the ingeniously designed Avalon Pergola will add the perfect amount of shade wherever you need it. A simple, three panel louver system allows for completely customizable shade in any direction. Just use the included handle piece to open and close the louvers. The Avalon pergola is created from premium vinyl and is maintenance free. We manufacture all of our products by moulding premium, hi-grade polymers around traditional structural elements to create the classic look of wood without the traditional maintenance. Just the occasional rinse with a garden hose is all you'll need to do to keep your pergola looking great year after year. We back this up with a generous 20 year warranty on your Avalon Pergola. The Avalon Pergola requires a drill, level, ladder, measuring tape, and two people to assemble. For installation on a wood deck or concrete patio, use our hassle-free Bolt Down Bracket System (purchase separately). Our Largest and most grand Pergola in our most popular style! Create your own outdoor room, a sanctuary, with our 12 x 12 Regency Pergola. The Regency Pergola is crafted with premium vinyl, and is therefore virtually maintenance free. The Regency pergola requires a drill, level, ladder, measuring tape, 2x6's and two people to assemble. The Mirage Pergola is the perfect addition to your outdoor living space. This 8ft.x8ft. classic flat top pergola provides the perfect overhead for a patio set or a hot tub. 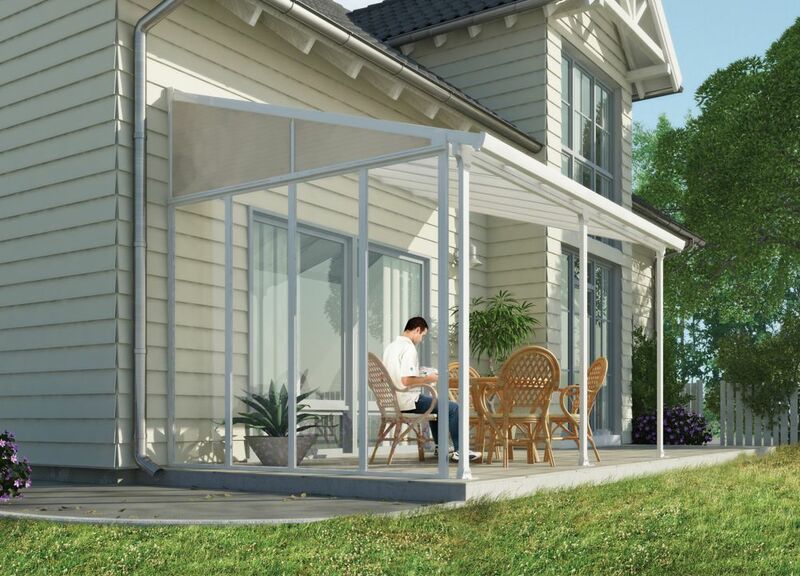 Crafted with premium weather resistant vinyl, this pergola is virtually maintenance-free. Just the occasional rinse with a garden hose is all you need to do to keep your pergola looking great year after year. This product comes with a 20 year manufacturers warranty against yellowing, warping, cracking, and rotting.Designed with architectural flair, the detail in this pergola sets it apart from all the others. Aluminum will rust and pit, but vinyl will last a lifetime. Beams are reinforced with steel to prevent sagging and to ensure a lifetime of enjoyment. 13 ft. Feria Patio Cover Side Wall The Feria Side Wall is an elegant, high quality solution that can be used to easily enclose the sides of your patio cover. Each unit covers one side of the Feria patio cover and is compatible with all cover sizes. The clear plastic panels provide year round protection from wind, rain and snow, and the low maintenance, high end powder-coated aluminum frame will not rust, rot or peel.